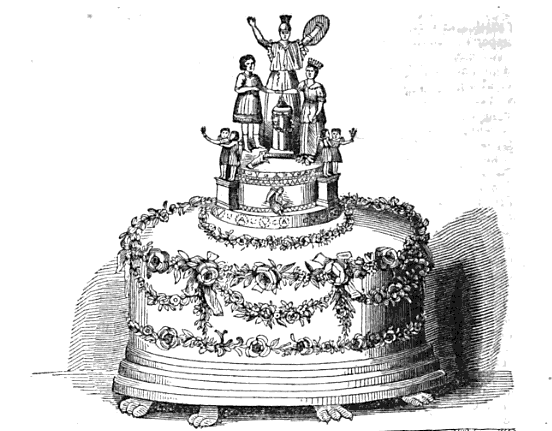 This Royal Cake weighed nearly three hundred pounds. It was three yards in circumference, and about fourteen inches in depth, or thickness. It was covered with sugar of the purest white; on the top was the figure of Britannia, in the act of blessing the illustrious bride and bridegroom—somewhat incongruously in the costume of ancient Rome. These figures were eleven inches in height; at the feet of his Serene Highness was the effigy of a dog, to denote fidelity; and, at the feet of the Queen, a pair of turtle-doves, denoting the felicities of the marriage state. A Cupid, writing in a volume expanded on his knees, the date of the day of the marriage, and various other Cupids sporting and enjoying themselves, as such interesting little individuals generally do. These little figures were well modelled. On the top of the Cake were numerous bouquets of white flowers, tied with true lovers’ knots of white satin riband, intended for presents to the guests at the nuptial breakfast. This important adjunct to the festivities of the Royal Nuptials, was the result of the labours and taste of Mr. J. C. Mauditt, the yeoman confectioner of the Royal Household, and evidenced talents of a superior order.